This Chocolate Cupcakes with Espresso Buttercream Frosting recipe is made with a super moist and fluffy cupcake base and a creamy and flavorful espresso buttercream. These chocolate cupcakes are very moist and fluffy. I find that in a lot of chocolate cupcakes the flavor is more on the bitter side. These cupcakes aren’t bitter at all! They also aren’t too sweet!! I added sour cream into this recipe as I do with most of my baking because it makes cupcakes and cakes so much moist and soft. This recipe also has coffee in the mix because it enriches the delicious chocolate flavor. The coffee flavor isn’t in the cupcakes themselves but the frosting does have that delightful coffee flavor that coffee lovers enjoy! If you don’t want to top these chocolate cupcakes off with the espresso buttercream frosting, it can be substituted for any frosting you like. The kids especially enjoy my Vanilla Cinnamon Sugar Frosting and they really love my Oreo Buttercream Frosting. 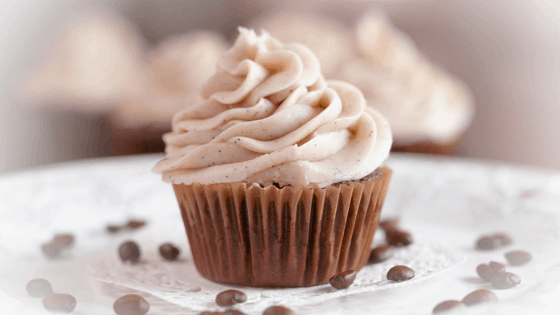 These cupcakes are topped with smooth and creamy espresso buttercream. The espresso powder makes this frosting rich with a delicious coffee flavor and it also gives you a spike in energy due to the caffeine in the powder. Mix together espresso powder and vanilla and allow espresso powder to dissolve. Using a mixer, cream together softened butter and half of the powdered sugar. Pour in the vanilla extract and espresso mixture and beat. Add in remaining powdered sugar and beat. Add milk 1 tbsp at a time until frosting is smooth. Line cupcake pans with 24 liners. Cream together softened butter and sugar. Add in salt, baking powder, and baking soda. Mix coffee granules into hot water, add to mix. Add in cocoa powder and milk. Slowly add in flour and sour cream. Mix until combined, do not overbeat. Fill liners half way through and bake for about 15 minutes and check with a toothpick for doneness.